We are happy to announce that we have a new board member: Rob Handgraaf. Rob will replace Petra van Liere-Addo, who we want to thank for serving on our board for almost five years! Rob and Jacqueline came over from France early this year to work, with the community of Liati Wote and our project manager Wisdom Kpegba, on the possibilities and opportunities to tackle the plastic waste challenge in the village. 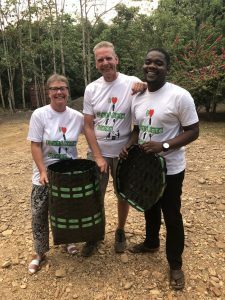 The first time Rob and Jacqueline came to Ghana was in December 2017 when they assisted Jolinaiko Eco Tours in the development of the Tagbo Falls Lodge in Liati Wote. They immersed very well in daily life in the community, and they became inspired by their drive for communal development. They actively participated in the communal labour activities, especially the clean-up exercises in the village. The environment of Liati Wote is beautiful, and the amount of plastic brought by tourists forms a major threat to the environment and tourism development. The people of Liati Wote appreciated their involvement so much that they enstooled Rob as their ‘Chief Sanitation and Development’. After their visit early this year, Rob also accepted to join Stepping Stones for Africa as a board member. So welcome on board to Rob and Jacqueline! We are very happy with your friendship, support and hard work! We are all looking forward to the development of this inspiring project that creates awareness and reduces plastic waste pollution in one of the most beautiful villages in Ghana.